CNN commentator Marc Lamont Hill says violence against Israel legitimate at UN pro-Palestine event. CNN commentator Marc Lamont Hill addressed the opening meeting of the United Nations commemoration of the International Day of Solidarity with the Palestinian People Wednesday. "This year marks the 70th anniversary of the Nakba," he said. "The Israeli nation continues to restrict freedom," Hill stated. "There are more than 60 Israel laws that deny citizenship rights to Palestinians just because they are not Jewish." He called the "Israeli criminal justice system" a "term I can only use with irony," as "Palestinians are routinely denied due process of law." Hill further accused Israel of turning Gaza into "the world's largest open-air prison." "As an American I’m embarrassed that my tax dollars contribute to this reality. No American president has taken a principled stand for Palestinian rights. I’m saddened though not surprised that Trump has further emboldened Israel’s behavior. He called the US recognition of Jerusalem as the capital of Israel and the relocation of the US embassy to Jerusalem as a "powerful provocation" and a"death knell" for the peace process. Hill noted that Trump's actions "are not wildly out of step with American policy" as his actions followed a law Congress passed in 1995. "Donald Trump is not an exception to American policy, but a more rather he is a more transparent and aggressive iteration of it. Hill said the international community must allow the Palestinian Arabs to use any methods necessary to resist Israel, implying that violence against Israel is legitimate. "Contrary to western mythology, black resistance to American apartheid was not" purely nonviolent, he said. "Tactics otherwise divergent from Dr. King or Gandhi were equally important to preserving safety and attaining freedom. If we are in true solidarity, we must allow them the same range of opportunity and political possibility. We must recognize the right of an occupied people to defend themselves. We must prioritize peace, but we must not romanticize or fetishize it. We must promote non violence at every opportunity, but cannot endorse narrow politics that shames Palestinians for resisting, for refusing to do nothing in ethnic cleansing." Justice requires a "Free Palestine from the River to the Sea," he concluded. Anne Bayefsky, Director of the Touro Institute on Human Rights and the Holocaust and President of Human Rights Voices, witnessed the event. "I have been watching the UN's so-called Day of Solidarity with the Palestinian People for decades and this was an especially obscene UN moment that reveals the true nature of the anti-Israel and anti-Jewish animus of the modern United Nations. " 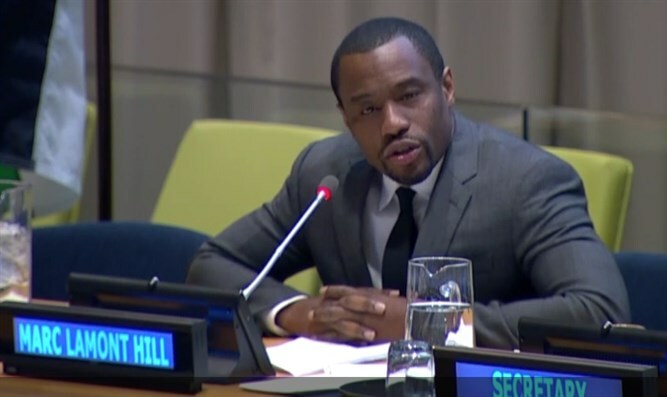 "CNN commentator and Temple University professor Marc Lamont Hill's call at the United Nations for the destruction of the Jewish state was not some accident. He didn't misspeak. He was an invited guest. He was the only person invited to speak as 'the' representative of 'civil society.' When he ended his extraordinary tirade with 'Give us a free Palestine from the river to the sea' his words were met by a round of applause. The only applause for any speaker," she observed. "The host and Chair of the 'UN Committee for the Inalienable Rights of the Palestinian People,' Senegalese Ambassador Cheikh Niang, thanked him profusely for his 'elegant words' & 'hailed civil society organizations.' There are no excuses for democratic nations to tolerate, to support and to finance a world organization that has profoundly corrupted its spirit and purpose." The International Day of Palestinian Day with the Palestinian People was created by the UN General Assembly in 1977. The commemoration will be held from November 28-30.